According to Forrester, B2C marketing decision makers indicated that 37% of their marketing program budget is spent on new customer acquisition, while in contrast, only 20% of their marketing budget is spent on driving retention of existing customers or upselling to them. If your organization is tipped in favor of customer acquisition, you need a better strategy. In this white paper, find out why the whole customer journey lifecycle must be considered with a holistic approach – one that spans your business strategy, the kinds of customers you target, your operational process, and technology solutions. 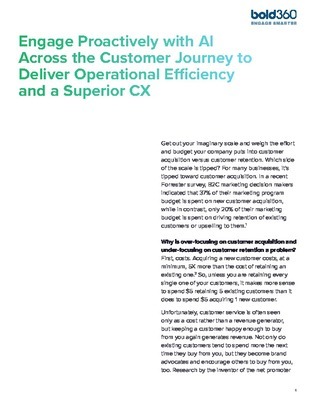 Learn how one platform can provide consistency across the customer journey, and how that can help your organization provide better CX, leading to a higher ROI.